Description: There are four recognized species of giant salamanders (genus Dicamptodon), all found in the Pacific Northwest as far east as the Rocky Mountains of Idaho and as far south as coastal California. One of these species, coastal giant salamander (formerly referred to as Pacific giant salamander), occurs in our area. 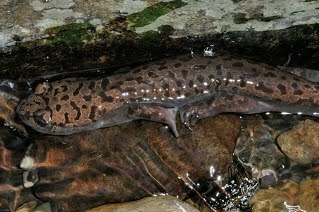 Giant salamanders are almost entirely stream-breeding species, associated with pools, riffles, and runs, except for some populations of coastal giant salamander that occur in perennial, high elevation lakes and ponds. In many small streams, giant salamanders are the dominant predator, and a wide range of sizes will be present. Coastal giant salamanders are most frequently observed in the gilled, aquatic life stages, which include both the immature, larval stage and, in some populations, a mature, gilled (or “paedomorphic”) form. True to their names, coastal giant salamanders can attain impressive sizes: paedomorphs have been reported as large as 14 inches total length, larger than any other salamander in the Pacific Northwest. Compared to larvae of pond-breeding salamanders, such as northwestern salamander, coastal giant salamanders have relatively long, stream-lined bodies; flattened, shovel-shaped heads; a low tail fin; and smaller gills. Larvae and paedomorphic coastal giant salamanders are tan, brown, or gray, sometimes with lighter blotches, streaks, or mottling. Juveniles that metamorphose, lose their gills, develop a rounded head shape, and are often colorfully patterned in gold or tan on a darker background. Older individuals are usually darker and less prominently patterned. These are stocky, robust animals, capable of biting in defense. After metamorphosis, individuals are terrestrial in moist forests adjacent to the natal stream, living under logs or rocks, in existing burrows and root channels, and rarely observed without deliberate searching. 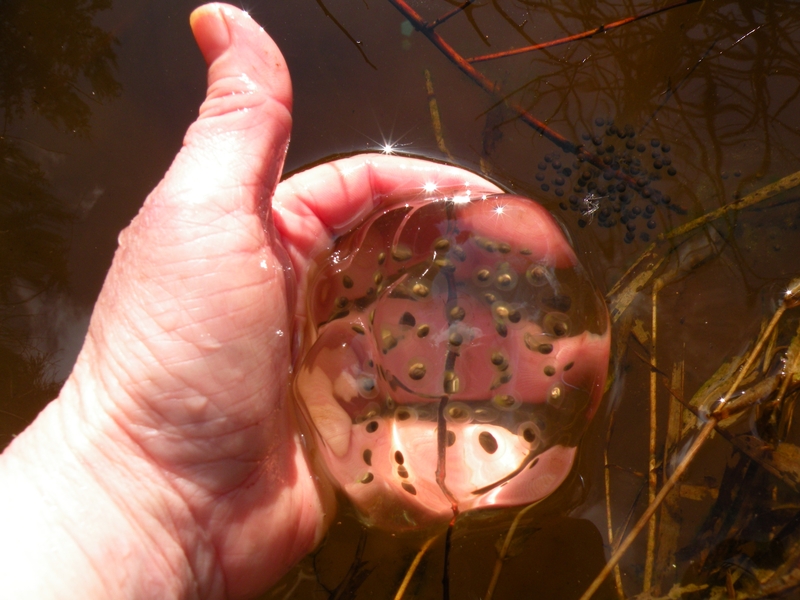 Breeding often occurs in headwater habitats. Egg Description: Eggs are white, attached to the underside of large, flat rocks and logs and are attended by the female until hatching. Habitat: Gilled forms are mostly found in small to medium-sized mountain streams with surrounding moist coniferous forests. As larvae grow they may move downstream and the largest individuals may be found lower in the watershed in larger stream channels. Transformed coastal giant salamanders are usually found within 50 meters of a stream. Locations in Whatcom County: Coastal giant salamander occurs from southernmost British Columbia to northern California (Mendocino County). In Whatcom County populations are known from tributaries of the Nooksack River and from Chuckanut Mountain. The distribution of this species in Whatcom County is not well documented.